Propagating plants from seed will provide access to a far greater range of plant varieties than buying seedlings and plants will have a better start in the garden. You are also contributing to improved food security for all of us. sourcing seeds that are grown organically and heirloom varieties and saving seed from the strongest and healthiest plants for the next crop or to share with other gardeners. These are grown by certified organic producers; that is, without the use of artificial fertilisers or harmful pesticides and herbicides. These seeds are an important part of a sustainable eco-system and are becoming more available from specialist on-line seed companies covering a wider range of heirloom varieties. These seeds may or may not be produced organically. They come from varieties that have been grown for many generations and proven their worth in reliability, taste and nutrition. They are open-pollinated and the seeds are true to type in subsequent generations. If you are saving these seeds, isolating some plants (eg brassicas) from cross-pollination may be necessary, however, to preserve genetic purity. A lot of commercially available seed (and plants) is from hybrid varieties that are an engineered crossing of two widely different varieties. They are bred for qualities that generally have little benefit to a home gardener (eg shelf life) at the sacrifice of taste and nutrition. They may have strengths in favourable conditions but in the home garden they have significant drawbacks. By design they have little variability – a valuable defence in nature to pests and diseases – and even more importantly, the next generation seed is weak or infertile. Organic gardeners do not use seed of plant varieties that have been genetically modified. 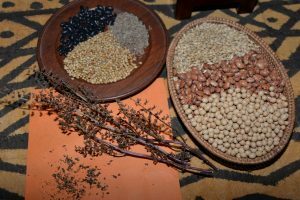 A great source of guidance on seed saving is the Seed Savers’ Handbook (see Links & References). Use seed that is fresh and has been properly stored to preserve its viability. If sowing in containers (eg a seed tray) use a growing medium that is fine-textured, moisture retaining and of low fertility. Poor seed mix will set back plants for the rest of their life. The growing medium should never be allowed to dry out. Whether sowing in containers or outside in a seed bed, soil temperature is a critical factor for germination and this varies with the plant. Many vegetables (including solanum and cucurbits) need a soil temperature above 20 degrees C to germinate. Some plants will germinate at cooler temperatures around 15 degrees C; for example, English Spinach. Give the germinating seed good light – sunlight or, indoors, a horticultural light with a spectrum balanced for growth. Seedling grown in containers need to be “thinned out” at a young stage to select the strongest plans and reduce competition. Hardening-off is necessary to accustom the young seedlings to the harsher conditions in the ground exposed to the weather. Give them an increasing span of sunshine over the course of a week while keeping them moist and cool. In a cool climate like Canberra, propagating from seed indoors in late winter can give you a valuable head start of 4 to 6 weeks in your Spring planting. A thermostatically controlled incubator is great for this purpose or at least a sunny window.